Goodreads Summary: Jocelyn's twin brother Jack was the only family she had growing up in a world of foster homes-and now he's dead, and she has nothing. Then she gets a cryptic letter from "Jason December"-the code name her brother used to use when they were children at Seale House, a terrifying foster home that they believed had dark powers. Only one other person knows about Jason December: Noah, Jocelyn's childhood crush and their only real friend among the troubled children at Seale House. This book sounds very spooky and unlike anything I've read before. I'm curious to see how everything will play out! Wonderful choice! 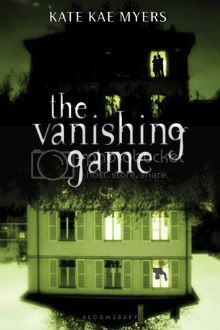 Vanishing game sounds interesting. That's one creepy cover. Love the sound of it too. Definitely need to give it a read. Thanks for sharing. Reminds me a little of Pretty Little Liars! Ooh that looks interesting! Love a good spooky book! OH this was my WoW a few weeks ago I can't wait to read it. Awesome pick! Oh man, this looks creepy. I don't usually read these types of books but I think I'll give it a try. This sounds really creepy!! Awesome pick!! oh! that sounds so spooky and haunting! great pick!